For about fifteen years now, many countries of the Near and Middle East, the Persian-Arabian Gulf, and Tunisia, have witnessed a revival of narghile. During the same period, we have seen in other parts of Asia and Africa, in Europe, the Americas, and Oceania, the emergence of establishments the central service of which is based on narghile (hookah, shisha) and its unique conviviality. 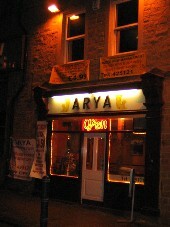 We term these coffee-houses "neo-Orientalist cafés". Obviously, the sociability of such salons entices a wide audience because it is known that in virtually all societies of the North, traditional brotherly social relations tend to split. Consequently, one can meet in these new places, sitting side by side, a civil servant and a student, a janitor and a doctor, not to forget all the exiles and Diaspora members. Narghile (hookah, shisha) concentrates such lost values as the conviviality desire, brotherhood, peace and solidarity, at a time when wars, particularly in the Middle East, and forced emigrations and exile, artificially separate peoples from each other by putting obstacles in the way to intercultural understanding and friendship. However, in practice, everything is not so simple. For instance, severe laws made, until recently, difficult the commercial import of narghiles in the United States of America and in a country like France, tobacco is still a kind of State monopoly. For those who may travel to the Near and Middle East, it would be here vain and tedious to provide them with a list of places where they can see narghile smokers. Uncountable and omnipresent coffee-houses, restaurants, taverns, inns and hotels provide the service. In this country, the traveller should know that narghile - locally called "shisha" - has been officially banished from the cafés terraces. Consequently, it escapes observation, particularly that of curious tourists. It is therefore necessary to go inside the coffee-houses in order to be able to see the wierd artefact. "a place that is very popular among both the Colombian Arab community and the non-Arabs who are just curious. I've been there a couple of times with my girlfriend (who by the way is Lebanese) and herfamily. Its quite a nice play to be, great environment and good food. 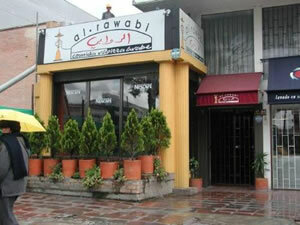 The coffee-house is called "AlRawabi"and they are located in Bogotá in 2 places: Calle 116 No. 17-55 and Calle 85 No 12-61"
Many thanks to Juan Carlos Cuervo (Bogotá, Colombia) for the information. Salons have opened their doors in big provincial cities like Lyon or Marseilles. An amateur told us [in 1997] that in the latter, he envisaged to open a "cultural café" the service of which will focus on narghile (hookah, shisha). He informed us that there was, by that date, three active establishments of this type. As for Paris and its region, the number of neo-Orientalist cafés is growing continuously (more thant 100 in 2004). 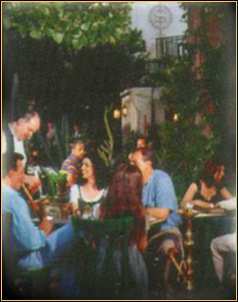 May we mention here: "Imhotep" ("The Egyptian café") in the vicinity of Mouffetard Street ; "Le Grand Bleu" (intimate and Tunisian atmosphere) and, by its side, "Le Sultan" (19th district); "Le sable doré" in the Saint-Lazare area (9th district); The Mozaik in the Rue des Martyrs; Shéhérazade in Chartres. Persian or Arabic are not inevitably spoken but rather French, English and other European languages. Patrons plays chess or draughts and since one must not forget that narghile is a conversation catalyst, they chat a lot. The interior decoration may be modest; no matter, sophistication is not necessary. The craze of numerous Americans for narghile (hookah, shisha) and its special atmosphere, despite the existence of severe laws, according to which it is more or less considered as drug paraphernalia, is real. However, there are two categories of narghile (hookah, shisha) users in this country: the first ones mainly look for marijuana effects (their water pipes are often the so-called "bongs"). The second ones exclusively consume pure or special flavoured honeyed (mu'essel) tobacco in their "hookah".